BEIJING: The Chinese foreign ministry Friday rejected a media report that it was planning to build military equipment including fighter jets under China-Pakistan Economic Corridor (CPEC) framework. 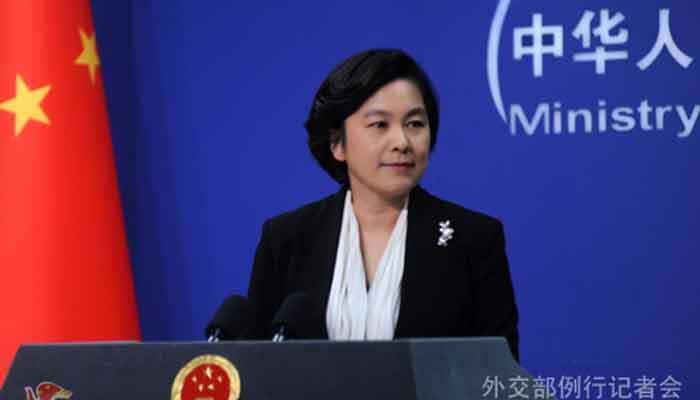 “According to our information, the relevant report is not true,” Chinese foreign ministry’s spokesperson Hua Chunying said during her regular briefing held here. She remarked that the CPEC was an important framework for cooperation bearing long-term interests for both sides. The New York Times reported Thursday in a long dispatch claiming that Beijing's "Belt and Road" plan was taking a "military turn" as Pakistani Air Force and Chinese officials are putting the final touches on a plan to expand Pakistan’s building of Chinese fighter jets, weaponry and other hardware. The dispatch said that the newspaper had "reviewed" the confidential plan which it says also envisages the cooperation between China and Pakistan in space. "All those military projects were designated as part of China’s Belt and Road Initiative, a $1 trillion chain of infrastructure development programmes stretching across some 70 countries, built and financed by Beijing," NYT's correspondent Maria Abi-Habib wrote from Islamabad. Referring to the meeting of Joint Coordination Committee (JCC) on CPEC held on December 20 in Beijing, the FO spokesperson observed that the two sides would continue to implement the consensus reached between the leadership of the two countries to cement the early harvest projects and to extend the CPEC to industrial parks and social livelihood. To a question regarding reports of withdrawal of the US troops from Afghanistan and Syria, she said that China’s position on these two issues was consistent. Hua Chunying said that as the close neighbour of Afghanistan, China stood for the Afghan-led and Afghan-owned inclusive reconciliation process. “We are willing to make concerted efforts to achieve long-term peace and stability in Afghanistan helping the Afghan people to enjoy peace and stability at an early date. To another question about Syrian issue, she said that the Chinese side always believed that sovereignty, independence and territorial integrity of Syria should be respected and the future of Syria should be determined by its own people. The spokesperson said that China would like to work with the international community and continue to play a positive and constructive role in the early settlement of Syrian issue.